The Characins or Characidae belong to the order Characiformes comprising families of freshwater tropical and subtropical species. Characidae originted from the southern parts of north America, South America and parts of Africa.So far more than 1000 species in Americas and 200 species in Africa have been identified. In nature Characins inhabit a wide range of habitats in various rivers and certain varieties are blind and inhabit caves. These ornamental characins vary in size with the smallest known growing to the 12 mm length. They also come in varied shapes like the compressed shape of hatchetfish and the elongated shape of pencilfish. An important characteristic of these ornamental fish belonging to family Characidae is the presence of adipose fin. However some genera of these do not have the adipose fin whereas some types of catfish have adipose fin. Unlike catfish, Characidae do not posses whiskers or barbels. Almost all Characins have 'Weber's apparatus', a connection between the swim bladder and hearing organs which helps to amplify the surrounding sounds. Characins also have teeth and scales. Ornamental Characins prefer clean and clear flowing water. They prefer highly oxygenated water with pH 6.5 to 7. They are mostly schooling fish and for their normal behaviour it is advisable to keep them in groups of at least ten numbers. These ornamental fish have the tendency to jump out. Hence the aquarium is preferably covered. It is also advisable to provide plants and protective spaces in the ornamental fish aquarium for these to hide when disturbed. Most of the ornamental Characidae do not breed easily and they scatter the eggs and do not engage in parental care. 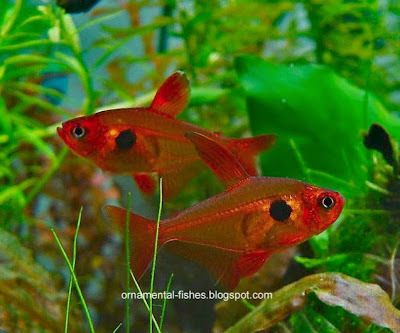 In aquarium these ornamental fish are omnivorous taking pellet or flake food, dried bloodworms and live feed. 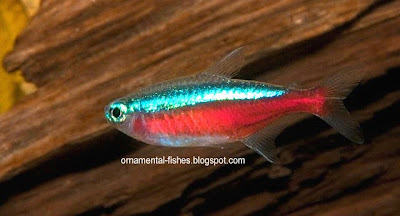 In the ornamental fish trade all types of tetras, pencil fish, hatchet fish, headstanders and silver dollar have been clubbed together as Characidae or characins. The Characidae family has under gone a taxonomic revamp and pencil fish, hatchet fish, silver dollar, piranhas and headstanders have been moved to related families of their own. 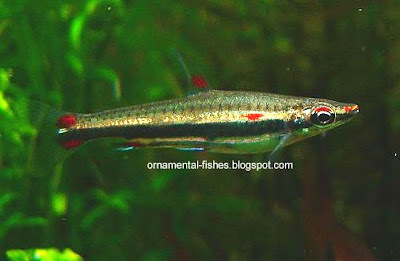 Presently Characidae comprises tetras (Hemigrammus and Hyphessobrycon) and a few related forms like blind cave tetra and neon tetra.